As a user if I access the system between 13:00 and 14:00, I cannot place an order and the system will provide an appropriate message. For this we anticipate having an "OrderSettings" VBScript class and properties that will indicate the cut off time and next order time and a function that will tell us whether a user can place an order. Therefore we can write our tests before we write the class itself. 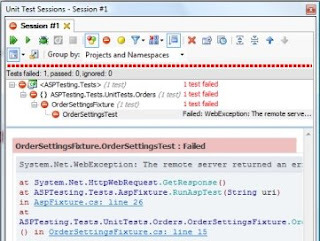 tester.AssertIsFalse currentOrderSettings.CanOrderAt(onePm), "Can Not Order At 13:00"
Here, we are expecting a new OrderSettings class to have a function called CanOrderAt - we pass the date/time in and it returns true or false. Note that we are using dates here for our time functionality and not strings... we made this choice so that we can use the date types and functions to assist us and this can also be stored reliably in the database. Now, when we run our unit tests, it still fails, but this time as a result of an assertion and not an exception - we now have somewhere to start with our Red, Green, Refactor TDD process. When we run our unit tests, they pass and we have our first fully functioning unit test on a requirement. Time for some refactoring and more assertions (from hereon we shall not look to screenshots and take it at face value when a test is described to pass or fail). tester.AssertIsTrue currentOrderSettings.CanOrderAt(twoPm), "Can Order At 14:00"
With this change, our unit tests pass, but we obviously need some refactoring to get this code into a correct state and we logically turn to the properties and want write the code to store those values - we can then use them in our CanOrderAt function. We insert some more assertions, this time for the properties (we might do this one at a time in true TDD, but for brevity we shall do them together here). If we run our unit tests again, they blow up with a server error as the properties do not have Get implementations. We add the get code into the file but initially as empty placeholders, then watch our unit tests fail on an assertion exception instead. 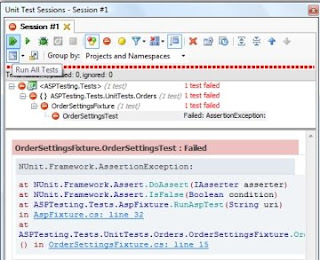 We will take a break here so that this post doesn't become too long - in the next part of this series we will continue to refactor this class and further illustrate test-first development in action using classic ASP.